Where did it say images were not included? I noticed this after installing. looks nothing like the demo presented. Anything I can do to correct this? I want it to look like the demo. The content on http://trapezaki.com/ does not look at all like Dentalia. This is not our Demo content, it seems like it comes from another theme? You can use the WordPress reset plugin to delete all content and WordPress settings, then import the demo in Theme Options -> Demo Content. It is always best to import the demo (of any theme) on a fresh WordPress installation. Let us know if you need our help with demo import. The photos are not included with the theme, because they are stock images and the license does not allow us to redistribute them. 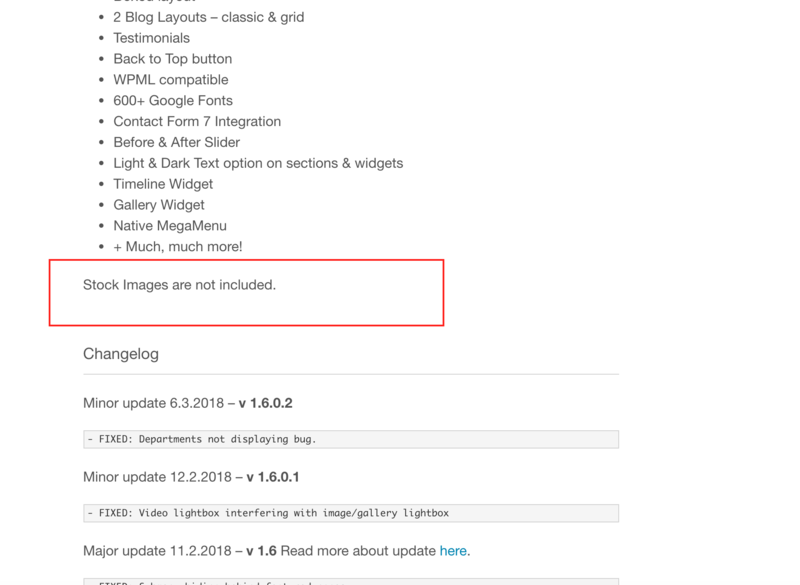 This is also written on the item description on ThemeForest (above the changelog section). Here is the screenshot. If you decide to keep the theme, you will see it is a very good theme, with a lot of options and possibilities. A lot of work has been put into it and we are still developing new features and adding them with updates. I am sorry for your disappointment about the images, but consider changing your 1-star rating. We would gladly include all the photos if the license allowed us.